Just back from a trip into Romania. I'm off to Paris soon to teach, and there is nothing French violinists crave more than a Romanian vioara cu coarne, or as they say in Bihor vioara cu goarne. And there is nothing I crave more than French seafood so the Romanian trumpet fiddles - so loud and lovely to play - are going to be converted into mere commodities in my quest for huitres and Vietnamese seafood pho. One of the makers of this instrument is Dorel Kordoban, from the village of Lazuri. Until recently, all my trumpet violins were bought from him. 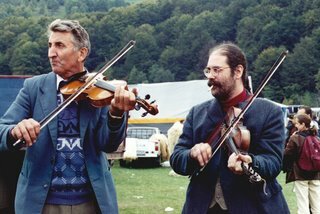 That's us playing on normal fiddles at Negreni a few years back.